We perform eye and lip make-up removing using the liquid make-up remover for the eyes and mouth. The face, neck and neckline are purified using the ultra-moisturizing cleansing cream. We tone the skin covered by the ultra-moisturizing procedure tonic for the face. NOTE! We protect our hands with latex or vinyl gloves. Before we proceed to the treatment, we secure the area of the eyes (using a dry cotton pad), the wings of the nose, corners of the mouth, unusual signs of dye, skin damage (using a vaseline or a fatty cream). Patients are asked to have their eyes closed during the treatment. During exfoliation, we constantly observe reactions of the skin, we ask how patients feel. It is not advisable to move away from the seat. The micro-exfoliating gel-tonic (500 g) is applied on a cotton pad and the skin subjected to exfoliation is washed, avoiding the eye area. This can be repeated twice, each time replacing the pads.NOTE! The skin, prior to contact with the product, should be cleaned and dried. from the front, followed with the other parts of the face. 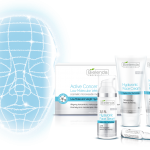 Skin reactions should be monitored (the recommended treatment regimen for easy selection of the time of peeling is given in the inner part of the leaflet).NOTE!Observation of the skin and an interview are the basis to determine the individual time of the preparation being left on the skin. 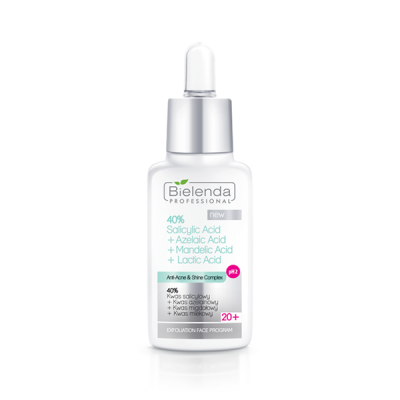 In the case of any reaction – severe burning, redness, tingling – the acid action should be immediately stopped by applying the acid neutralizer. Then, the skin is to be washed with lukewarm water and dried with a treatment tissue. We apply a thick layer of the zinc soothing mask, avoiding the eye area. We leave it for 15 minutes, then the skin is washed with lukewarm water. 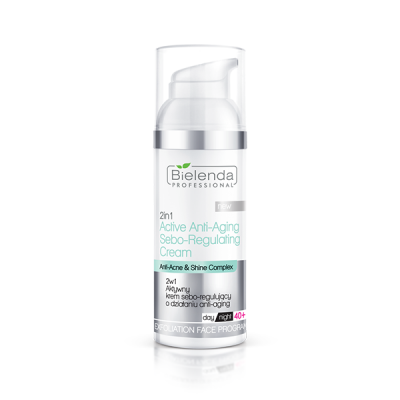 We tone the skin using the ultra-moisturizing face tonic..
At the end of the treatment we apply the peptide gel-cream correcting wrinkles around the eyes, and we apply the SPF 50 sunblock for the eye area and on the face, and the spot imperfection reducer onto the inflammatory skin changes. During any series of acids, the skin should be prepared at home (PRE PEEL). 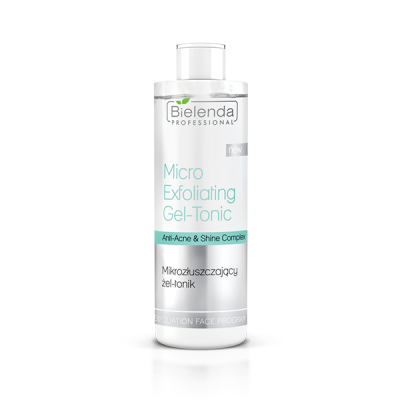 This involves the skin cleansing with the micro-exfoliating gel-tonic (200 g) once daily for 7 consecutive days prior to any planned exfoliation treatment in a clinic. NOTE! We perform no other peels, especially mechanical, during the acid treatment. We also do not sunbath or go to a solarium (any contact with the sun is forbidden before, during application of the treatment and two weeks after its completion).